During the past couple of months, we’ve worked like crazy on our Krautkopf app and now it has finally come: the app is available in the Apple App Store! To celebrate this special moment, we want to share one of our favorite recipes from it. 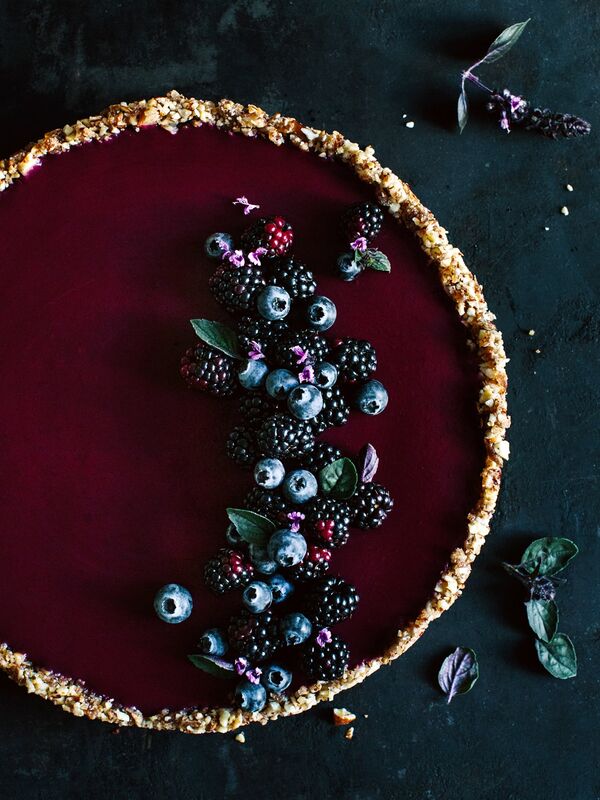 The dark berry basil tart landed a few times on our cake plates this summer. 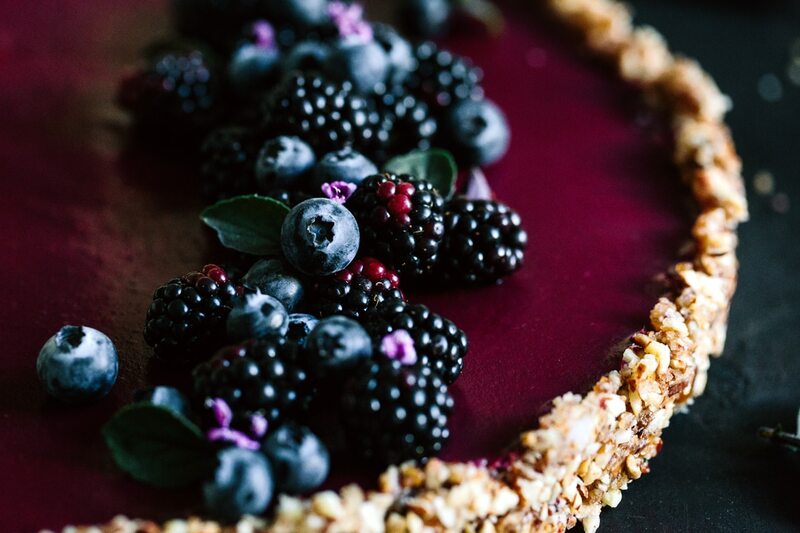 It is a perfect dessert for hot days, since the oven remains cold for this tart. Summer cake that must not be baked, but coming cooled from the refrigerator, is our favorite. If it’s loaded with a bunch of berries, nothing can stop us. 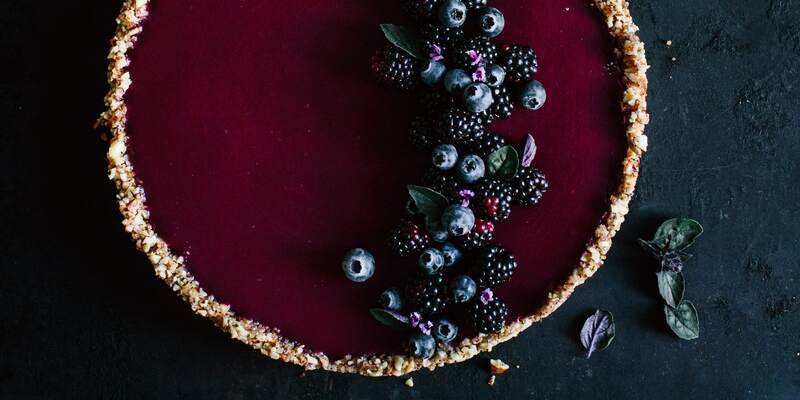 Red basil adds a delicious flavor to the berry tart and matches its color. 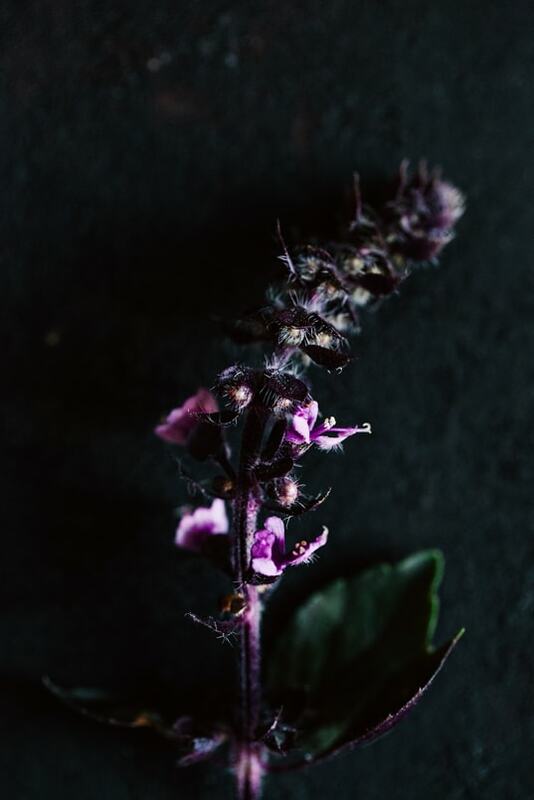 It is slightly more minty than the standard Genovese basil, and the leaves and blossoms are very decorative. For the cake base coarsely chop dates. In a pan without oil, roast almonds, hazelnuts, and sunflower seeds until they begin to crack. Chop cooled nuts and kernels in a blender. They should not be too coarse, so that the mass will keep well but is not ground to flour. Add dates, coconut oil, and salt, and continue mixing until you get a sticky mass. Fill mass into greased springform (26 cm in diameter), and with a large spoon, press firmly into the form. It should create a rim of approx. 2 cm height. Place cake base in refrigerator. For the filling, pick off basil leaves from stems and finely purée berries with basil leaves. Then pass through a sieve. Add coconut milk to fruit purée and season to taste with maple syrup and lime juice. Then stir in starch and agar-agar with a wire whisk. In a saucepan, while stirring continuously, bring berry purée to a brief boil. Then pour into a bowl and let cool until lukewarm, stirring occasionally. Spread filling on cooled cake base and shake the springform gently to avoid small air bubbles. Place tart in refrigerator for at least 4 hours. 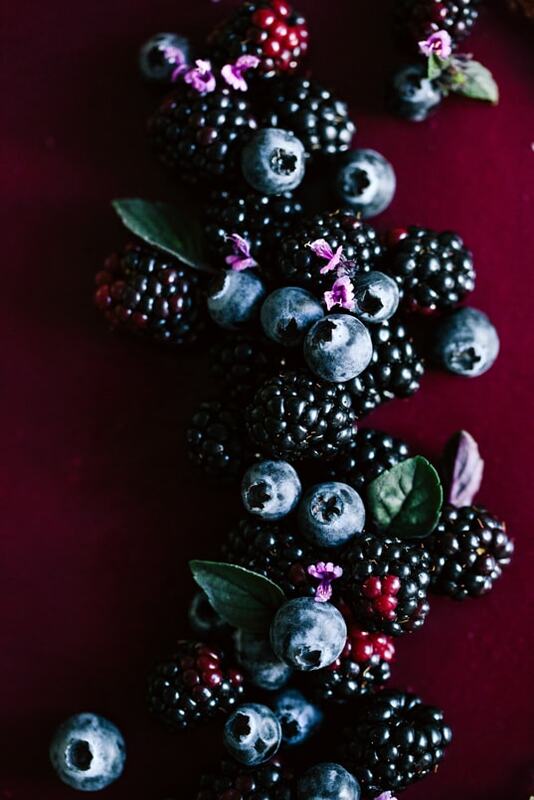 Then garnish with remaining berries. Ehrlich, ich bin so stolz auf mich, die Tarte ist wunderschön geworden!! Und ich bin stolz auf “KrautKopf”! Ein Wahnsinnsrezept! Optisch wie kulinarisch ein absoluter Hit!